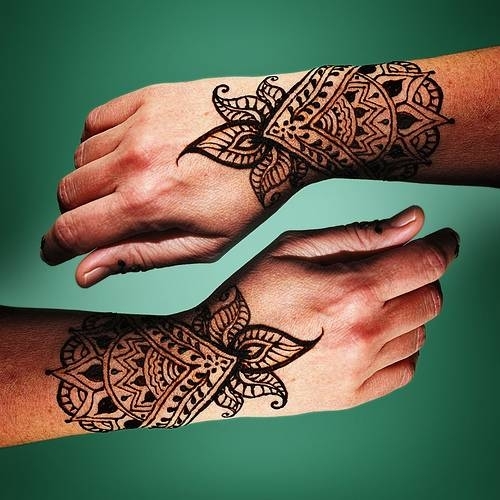 Henna tattoo is the coolest, fashionable and the most popular temporary tattoo of the new generation. Since Madonna, Demi Moore and many other famous names started showing off various henna tattoo design, it became a fashion rage not just in the United States or Britain but globally so to speak. It is famous from kids to teens to adults and art lovers of all ages. People loved it because it is simple yet beautiful, cheaper and painless and the best so far is the fact that you won’t be stuck with it for life. Isn’t that great?! How does henna tattoo work? Are there numerous henna tattoo design you could choose from? How quick does it fade? Why does it fade? These are just few of the many questions people asks the first time they get their henna tattoo or introduced to this amazing body art. Henna tattooing is done using henna paste made from henna powder mixed with coffee or tea liquid and eucalyptus or lavender oil. Once the mixture has turned to paste, it is left for about 6 to 12 hours to settle but not too long for it to curdle and harden. When it has become toothpaste-like then, it is ready for application. Henna paste leaves an orange stain on the skin which would start to darken after 48 hours. It then turns to orange red. Provided that you know how to care for henna tattoo and how to do it right then, you’ll get better results that may last for 4 to 6 weeks and perhaps even longer. Make sure that after application you leave the tattoo for hours to dry before removing or washing away the paste. It is also good to use hair dryer or blower to dry the tattoo, that way it will keep it warm because temperature also plays a vital role in keeping the tattoo longer. The warmer is the skin the darker and longer the stain stays. Expert advices it is best to steam the skin before applying the henna paste after drying wrap it with a tissue beneath a plastic tape to keep its warmth before removing the paste after an hour or two. However, as much as you would want to keep the tattoo longer, you just can not. Henna tattoo will fade away in time because; our skin itself is temporary. The epidermis which is the upper layer of the skin regenerates, this mean that our body sheds off the dead skin,which is the hennaed portion of the skin, the henna tattoo that is located in the epidermis then will also shed off and will be replaced by a new skin cell. So, then you will notice that the tattoo gradually begins to fade away until it will disappear completely. Naturally, the henna tattoo will start fading after 10-15 days. But, fading may vary as to the area of the body where it is painted, the type of the skin and your lifestyle. This concept means, henna tattoo on skin areas like the face or neck that are constantly exposed and being washed may fade faster than when it is painted on unexposed areas of the body. Your lifestyle and daily activities will also affect the fading of the henna tattoo. If you’re constantly swimming on beaches, saunas, pools, hot tubs and the like, your skin’s regeneration is accelerated that will shorten the span of your henna tattoo. Nevertheless, that is the beauty of a temporary tattoo and such is a henna tattoo. You can have variety of henna tattoo design every time or experiment on your own and wear it just the way you like it. Cool!